Matthew Bramhall was a 'persistent' shoplifter in Blackpool's town centre. A man from Blackpool, who was previously sentenced for manslaughter in the town, has been sentenced again for ‘persistent’ shoplifting in the resort. 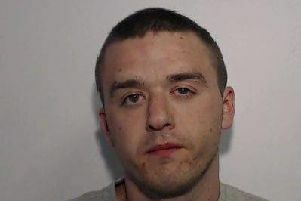 Matthew Bramhall (above), of no fixed address, has been sentenced to 46 weeks in prison for shoplifting in and around Blackpool town centre. The 34-year-old from North Shore was also sentenced for the possession of two knives upon arrest. A spokesman for Blackpool Police said: “Mr Bramhall is a persistent offender who has been causing chaos throughout our Town. Mr Bramhall was previously sentenced to five years after admitting the manslaughter of Gary Curry in 2013. Mr Curry, originally from Northern Ireland but had lived in the resort for many years, died in his flat after he was punched and head-butted by Mr Bramhall during a drink-fuelled fight. A post mortem examination revealed that the 43-year-old had died from head injuries after he was found dead in his flat on Eaves Street in North Shore.